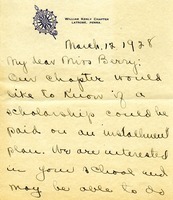 Letter asks about a scholarship that can be paid on an installment plan; it expresses the William Kenly Chapter's interest in Berry. 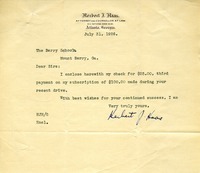 Lulu of the Duluth, Minnesota First Presbyterian Church sends Miss Berry $75 that she hopes will help a young man wishing to go into the ministry. 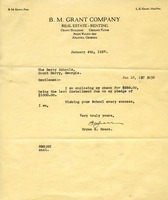 She also discusses how Miss Eleanor Thomson told their class about the Berry Schools and how her subscription money is included in the check. 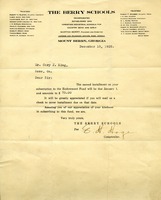 Mr. Hoge notifies Mr. King about his second installment to the Endowment Fund.